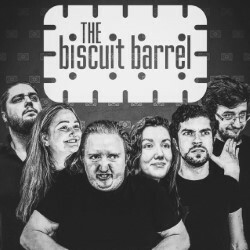 Biscuit Barrel return to the Fringe with an even naughtier 69 sketches in the space of an hour! Mercilessly outrageous; always hyperactive. At a time when online comedy seems to race ahead of live performance, the Barrel take one back for the theatre – this is the speed of the internet put on a stage. 'Fast, slick and very funny' ***** (The Derek Awards, Special Merit Award winner 2018).